Caraval was one of my most anticipated debuts for 2017, and there was tons of hype surrounding this book. But, unfortunately for me – it didn’t live up to it. Its not a bad book by any means, I just didn’t love it like I was hoping I would. Scarlett and her sister Tella have never left the tiny island they live on with their abusive father*. But, Scarlett has always dreamed of experiencing the mysterious Caraval hosted by the powerful magician Legend. A week before Scarlett is to be married, her ticket finally arrives and with the help of a new “friend,” Tella and Scarlett make their way to the show. But upon their arrival, Tella is abducted by Legend. As it turns out, the winner of this year’s Caraval is the first person to find her. Scarlett is warned repeatedly not to fall under the lure of Caraval – that it is all a performance. But she still gets swept up in the game. And even as she begins to question everything, she can’t give up because if she doesn’t finder her sister before the 5 days of Caraval are over, she may never see her again. The book is interesting to be sure – its full of magic and mystery. And the writing is beautiful (think Laini Taylor). I loved all the descriptions of Caraval. It reminded me a lot of the market in Stardust when Dunstan asks how much a flower costs. And, he’s told that it might be the color of his hair or all his memories before he was 3. Caraval is like that. You don’t pay for things with funds, but with secrets or truths or even days of your life. In addition to the Caraval competition, there is also a love story in here. And, though its pretty insta-lovey, by the end of the novel, I found that I really didn’t mind. So why only 3 stars? The reason for that is twofold. Firstly, there is very little character development or world-building. The story relies heavily on the metaphor to give atmosphere to Caraval – but we are provided with very little concrete information about the world in which Tella and Scarlette live. And Tella herself is a pretty two-dimensional character despite being central to the story. And secondly, once the plot was resolved, I was pretty “meh”about it. It was a case of all tell and very little show which is pretty frustrating for me. And, like Caraval itself, I felt a little like I’d been tricked. But, I do think the “moral” of the story is really wonderful. Because at its heart, Caraval is about the bond between two sisters, and the power of hope and faith in the people you love. I just wish the focus had been more on that rather than this complicated mystery and big reveal. So if you are going into this because you love The Night Circus, you may be disappointed. Partly because I think its almost unfair to expect anything to live up to the beauty of Erin Morgenstern’s masterpiece. But also because you won’t find the heartfelt slow burn romance of Marco and Celia or the well developed characters and plot you may be expecting. But, I still think Caraval is worth the read because it holds a lot of promise, and the epilogue has ensured that I’m going to pick up Book 2. Because despite all my issues with the first installment, I do want to know what happens next. *There are multiple scenes showing/implying abuse perpetrated by girls’ father so if that is a trigger for you – please be aware. Loved seeing this review! I felt like a couple things were meh as well. I think the ending was too nicely wrapped up, sometimes the descriptions with color bugged a little and the trope that the guys are always hot in the books. I gave it 4 stars initially since I was surprised how twisty it became, but I totally agree with your thoughts 🙂 I’m gonna do a review of my own soon. Great job! Thanks! I look forward to reading your review. I always appreciate when people can admit that books have flaws – and that we can like the books while admitting they weren’t perfect. Thank you for your review! This sounds exactly like the type of story that I would enjoy. 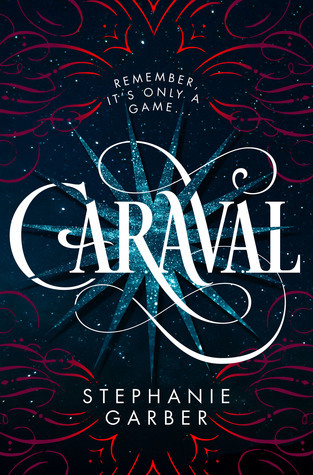 I agree – I read the night circus just before I picked up Caraval and I would in NO WAY compare the two – except for the fact that there were carnivals. I met Stephanie Garber this monday and she’s a really lovely person. When people would say good things about her book she would beam and look like she could cry. Really fantastic woman! That’s what I’m hoping – and part of the reason it got a 3/5 instead of a 2/5. There is just so much promise there! Yes exactly, the idea was there but the characters and some plot elements just weren’t.